Swamp Rats of the World Unite! Freemasonry arose as a white, middle-to-upper class male conspiracy against God and King which sought to establish a new deal of the ages, a wholly rational infrastructure, administered by white male land-owners of the merchant class, so beautifully logical in its operations as to cause order to reign forever, in spite of human nature. White because the child-races were not ready. Male because logic was alien to women. Landowners because they alone knew responsibility. Merchants because they knew how to balance the books. The celestial clockwork of the church was to be anchored firmly in the earth. 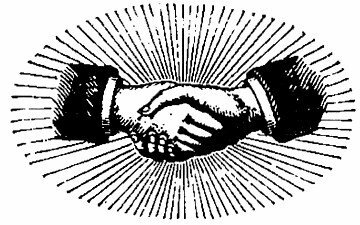 The royal monopoly on nobility was to be smashed and redistributed among all who could pass the entrance exam and return the secret handshake. So constituted, Freemasonry was not so much a body as a big fat head in search of a muscular mass to ride into the perfectible future. It succeeded with a vengeance in realizing the glorious dream: A racist, sexist, reductivist, venal order, headed by lawyers and accountants; an order so universally established that its logic is almost inescapable. Nearly everyone serves the planetary work and war machine, and a great many subscribe to its religion of profits and progress, persuaded by its logic– Ya gotta work to survive. Freemasonry, hybrid seed of the Renaissance quest to reassemble the potsherds of the Golden Age, spent its l7th-Century adolescence sifting through sand-piles of symbols, searching for portents, seeking the future in the detritus of the past. America opened her arms and offered herself as an only-slightly-smudged slate on which to write the New Jerusalem. In the eighteenth century, after Newton fused heaven and earth, the project began to seem more practical than philosophical. Gravity was the key by which their mad celestial schematics could be drawn down to enshroud the earth, to impose the map upon the unruly territory. No matter that the fit was imprecise, that the great, green riot of life was forever poking through the gaps, mocking from beyond the edges. No matter that our movement and speech were infected with its mad jazz patterns. When you live IN the map you hardly notice these things, any more than you notice the nameless ones silently slipping beyond the pale, leaving the map behind. Who cares who goes there, who goes nowhere? In 1717 the Grand Lodge of England was formed and the “respectable” half of masonry began pushing the “irregulars” off the map. Tradesmen, including any stone masons who might have been in Freemasonry, were among the exiles. In 1741 members of the black-listed lodges staged a wild masonic parade in London to ridicule the Grand Lodge. They called themselves Scald Miserable Masons. By this time numbers of exiled masons were washing up on the American shores- convicts, vagrants, rebels, Irish- sentenced or sold into plantation servitude from which they escaped at their earliest convenience. Most headed west of the seaboard colonies, keeping ahead of the advancing map, (the great wagon road making its way, north to south and west,) joining the multi-racial maroon communities of the South Carolina hills and elsewhere, some whole communities calling themselves Freemasons. But we may safely assume that at least a few of these Scald Miserable Masons were guided to the secret maroon capital of the upper south, there to become citizen-warriors of the Great Dismal Swamp, on the Atlantic coast where Virginia and Carolina meet, the heart of the New World. the American Eugenics movement. By the early years of this century they were promoting a Final Solution- compulsory sterilization. In 1907 Indiana was the first state to pass a compulsory sterilization law. It was aimed at a nomadic, tri-racial tribe in that state, the Tribe of Ishmael. Rather than submit to this the Ishmaelites dispersed. This law, which came to be known as “The Indiana Plan,” seemed like such a great idea that within twenty years 29 states had adopted similar Eugenic laws and the Indiana Plan had been adopted by seven European countries, most notably Germany, where it served as the legal foundation for an escalating series of racial laws that led, ultimately, to the Nazi Final Solution. At Nuremburg after the war there was much debate over whether or not forced sterilization could be prosecuted as a war crime. Of course, they decided it could not be, as it was still legal in the U.S. Today the descendants of the Maroons are still with us, some still living in the cracks, many more have blended into the crowds of the nameless. You may be one, in blood, or spirit, or both. Search the dark, rough recesses of your heart and mind. See if you can find traces of that Other America, the one that did not build its celestial city on a foundation of cruelty, murder and deceit, but gathered the exiles of four continents in its Great Dismal City of Refugee. Trapped between faith and fear, progressive liberalism is adrift in the current of modernity which eats away at faith and builds fear, moving toward an end which is only that: Finis. Lacking an articulate alternative, lacking, too, the communal basis of alienation, ours is a vague search for something which is missing. What is it? The counter-culture has always been just that. A negation bound up with what it rejects; the underside of liberalism. Its notions of human communion are tied to the immediate realization of something very like the old liberal utopia- total private liberty and gratification of desire. That old utopia is wholly blind to the nature of communion, rooted in self-loathing and fear of the other; hostility to the ego, a desire to blot it out; fraternity as alliance of embattlement again. The possibility of citizenship has been eclipsed, and, having been eclipsed, it waits to be bloom anew. It awaits a new polity, and in the dismal swamp heart of the “inner” city something stirs. Still we hide our bones for fear of being born because birth’s first lesson is loneliness. To build a new city among these multitudes of strangers we must learn to recognize our fellow citizens when chance shall throw us together, and find the means for affirming our mutual “patriotism.” We are obliged to set an example, to be the preachers and poets and tellers of tales of the great dismal city of refuge. We must steer clear of the Jeffersonian fraternal ideal which, in the name of unity, blows up such a cloud of sentiment as to obscure a dark and violent city. We must avoid charity as the plague it is, with its ethic of condescension. We must remember that war is no medicine for loneliness. Try love-laughter-song-dance, the tonics, before resort to narcotics and final solutions. In the lonely crowds of the urban wilderness there is mingled a saving remnant, a band of brothers and sisters, mostly unknown to each other, whose lavish hearts still accommodate the possibility of The Other America- who are holding the pass, so to speak, until we are ready, each in his or her own time, to go back over all the rough, dark places, to try, and finally, to fathom our old love-America. We must make the pilgrimage of Huck Finn, back to the beginning, divesting ourselves of false romance, disciplining our imagination in the school of nature, seeking fraternity with the strong victim, one to one, with the strength of personal character and devotion such that both of us are stretched toward our full stature. Then we shall find ourselves in the Great Dismal City of Refuge, candidates for citizenship. If we have learned well to recognize ignorance and dependence in ourselves and the world at large, and if we have learned to draw on the inexhaustible well of humor within which laughs aside our fears and pretensions, cheering us in our search for a true humanity, then we shall be the shining citizens of the Great Dismal City of Refuge, brothers and sisters in the global swamp-rat communion.